Haldane Soft Coated Wheaten Terriers is dedicated to raising Healthy, Happy, and well-balanced puppies. My "children" live in a basic pack situation in my home. All run together and have basic run of the house, with some restrictions. When I am gone all puppies and dogs that have not earned the right to stay out, go into their kennels. I am self-employed so I am at home a good portion of the time. The name Haldane comes from a set of books that I have read over the years, my first dog, Kelson, is named after the king and his surname is Haldane. These books are about a magical race of beings that live in a world that I believe is modeled after the Wheatens homeland of Ireland. I met my first SCWT about 23 years ago. 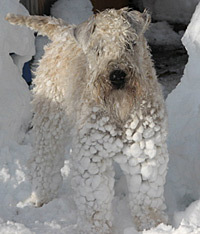 My landscaping company was doing a job in the Denver Country Club area, every day a man would walk his dog by the house, what a beautiful dog, one day I asked the man what kind of dog that was and he proudly said, "this is a Soft Coated Wheaten Terrier and they are the best dog in the whole world". Well at the time I had 3 young Maltese and could not have any more dogs, so I told the man someday I would have a Wheaten myself. My Maltese, Nicky, Sparkles and Bree, lived to ripe old ages and had wonderful lives. As my time came to a close with the Maltese, I started looking for a new dog and remembered the Wheaten. I got on the Internet and found the breeders list on the AKC site, started contacting breeders in the Colorado area. I got referred to a local breeder and ended up getting a show potential puppy from her and her co-breeder. One day she asked me what got me interested in the breed so I told her my story, she looked at me funny and said "what was the mans name", I told her and she told me that that dog happened to be a puppy out of their first litter!!! We both could not believe how small a world this really is!! My passion for this breed has continued to grow over the last seven years, I started to show my dogs and have learned much from many, many great people in this breed. 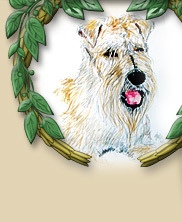 I am a member of The Greater Denver Soft Coated Wheaten Terrier Club. I am active in the Denver club and would encourage anyone who is owned by their Wheaten to join and participate in the club. There is a link to club information on the homepage.